Lots of New Things at PERC! We've been really busy the last few months! First, we'd like to introduce our themed bags. We have put together a series of kits dealing with different subjects of interest to parents and children. Some of these subjects include Potty Training, Kindergarten Preparation, Growing Things, Alphabet, and more. Each bag contains several books, a video, and at least one game or toy to illustrate the concept. If you're home schooling and you have a lesson theme, or if you've got a child who is struggling with a concept, these bags are a perfect solution. Thanks to a generous donation from Kid Budget, we have special items to give away. 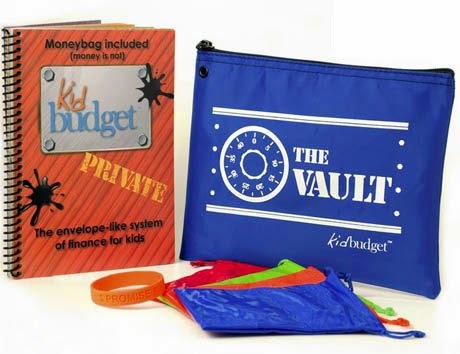 The Vault is a method for teaching money management to kids ages 6-10. It includes four pouches to separate accounts, a wristband to remind kids to save, and a workbook full of fun activities and lessons. These would make great Christmas presents for kids or grandkids. PERC has several to give away. Please ask a staff member for more information. Last, but certainly not least, there are a couple of new ways for you to support PERC! We have set up an account with Amazon Smile that will allow you to donate half a percent of any applicable purchases to PERC. Just log in to your regular Amazon account at smile.amazon.com and search for Parent Education Resource Center Orem when it asks you to choose a charity to support. In order for the donation to go through, purchases must be made through smile.amazon.com, and not the regular Amazon site, but both sites are functionally identical. The link below should make things easier for you. Some patrons have expressed an interest in donating a toy or game to PERC for Christmas. To make this easier, we have set up a wish list on Amazon. We really appreciate our patrons. Thank you for helping make this a great year at PERC!